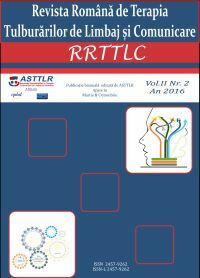 2016 RRTTLC - Martie, Vol II, Nr. 2. - Date ASTTLR:CUI 28916696. Cont bancar Ro03 BTRL 0130 1205 E819 63XX, deschis la Banca Transilvania. 2016 RRTTLC - Martie, Vol II, Nr. 2. Tulburarea de comunicare socială (pragmatică) - (TCSP). Studiu ilustrând percepția specialiștilor în terapia limbajului din România. Social (pragmatic communication disorder) is a new specific diagnosis category proposed in this form just from 2013 through DSM-5. This reorganization of the speech and language disorders implies new directions in the professional continuous development field for speech and language therapists. In this light this article details the investigation conducted in order to underline the position of the speech and language therapists from Romania regarding this new diagnosis of social (pragmatic) communication disorder, how often do they face this diagnosis, to what extend their initial training and continuous professional development trainings ensure suitable abilities and competences to work with children or adults with this diagnosis, to what extend to they express the need to get new information and new competences in the assessment and intervention field for this diagnosis. Results obtained (data were collected from 122 speech and language therapists) underlined the fact that even if social (pragmatic) communication disorder is not a classical speech and a language disorder, speech and language therapists from Romania meet here quite often and express great need for further training in this filed, even if some of them indicated that their initial and continuous training offered them good and functional abilities for assessing and intervention procedures for children and adults with social (pragmatic) communication disorder. These results were recommended to be taken into consideration for future accreditation of different educational training program in speech and language therapy field. This article approaches stuttering from a psycho-behavioral perspective, both during the assessment stage and during the therapy stage. This approach is developed within a case study, is underlined the fact that stuttering needs a complex therapeutic approach. This complex approach can be delivered by the speech and language therapists as part of an intervention team, besides the psychologist, the psychotherapists and of course the parents and the child. Knowledge and description of specific processes of instrumental functions and their implications in the development and operation of young children with intellectual disabilities, the causes that give rise to instrumental disorders, the factors that determine the areas in which they can occur, are essential in leading the preparation intervention programs that stimulate instrumental skills deficits. Ensuring early detection and appropriate therapeutic intervention for children with intellectual disabilities will eliminate these instrumental function disorders or, at least, may diminish as a result of their negative influences on personality. The paper will also present some evaluation and intervention methods for children with intellectual disabilities and instrumental function disorders for better inclusion in school and in the society; the methodology of this investigation is presented in a case-study. The aim of this case report is to describe a rehabilitation process based on the International Classification of Functioning, Disability and Health for Children and Youth (ICF CY) framework for a child with Down syndrome to show its applicability to this kind of genetic disorder. ICF CY is a derived version of the International Classification of Functioning, Disability and Health (ICF) for the adult population designed to record characteristics of the developing child and the influence of the surrounding environments. ICF CY belongs to the “family” of international classifications developed by the World Health Organization (WHO) for application to various aspects of health in children and adolescents. It provides a common and standard language and a framework for the description of health and health-related states to facilitate the documentation and measurement of health and disability in child and youth populations. ICF-CY gives specialists the opportunities to work toghether not only to provide separated intervention with the child, but also to work in partnership with the child`s family, peers, school and society. Integration of children with disabilities in mainstream school involves differantial approach and focuses on child` abilities. This means that the therapeutical approach is havily based on a thorough assesment sequence, assesment based on child`s abilities. This article establishes in the first part the theoretical framework for the second part which presents the practical aprroach focused on psychomotor abilities in children with intellectual disabilities. The main psychomotor abilities, the basic concepts- body scheme, lateralisation, perception of time and space were assessed in order to be able to establish the future therapeutical coordinates of the intervention plan. The assesment procedure, as practical aspect was reinforced by the set of practical exercices throgh which the aim was that to ensure enriching children with new abilities. A case study was presented in order to particularize both the assessment procedure, as well as the intervention approach, so that this case study can be considered an example of a model of good practices in the field of intellectual disabilities. Key words: psychomotor, personalized intervention, intellectual disabilities, perceptual-motor structures, school integration. The general purpose of speech and language therapy, concerning rhinolalia, is removing the nasality from speech by developing a functional breathing ability, differentiating between nasal and oral breathing through the correct use of the epiglottis-laryngeal mechanism of closing. In the case of the functional open rhinolalia, it is recommended the speech and language therapy to ensure the development of a correct articulator basis. The speech therapy exercises are aiming especially the mobility of the velum and the coordination of the phonoarticulatory organs (for the mobility of the velum there are recommended exercises of blowing into different objects because the air under pressure is acting as a good massage for the velum; exercises done by blocking one nostril and trying to breathe; exercises of frequent deglutition of slight quantities of liquids). The next stage of the therapy will be based on differentiating between the oral and the nasal breathing, on increasing the respiratory volume and precision and on prolonging the time of breathing out in verbal production. After gaining control over the phonoarticulatory organs and the velum, phonetic exercises need to be implemented. It is important to put a great emphasis on the special gymnastics of each organ and on exercises of oral conduction of the respiratory wave. The sound producing must be obtained by using games and play therapy background. This article is focused on attention deficit hyperactivity disorder and its implication on reading and writing skills. The negative implication of attention deficit and hyperactivity on children is reported since the early ages but they expenad during the school age period, when the parent faces child`s difficulty to adjust his behavior in the educational setting. Thus, children facing ADHD also face reading and writing difficulties. In order to prevent reading and writing disorders for 10 children diagnosed with AHDH we compared the efficacity of two different intervention programs. Results demonstrated that the intervention program which combined different approaches from the speech and language therapy area (Meixnar and Sindelar approaches), in comparison with the intervention program based on the phonetic-analitic-syinthetic method ensured a higher and more stable level of reading and writing skills for children with ADHD. These results bring into light the need to adjust and find more flexible ways in order to approach children with ADHD and also the fact that the implamentation of prevention programs for reading and writing disorders is a necesity in ADHD context. Keywords: attention deficit hyperactivity disorder-ADHD, reading and writing disorders, prevention, complementary methods. It is known that children with ASD presents specific features of auditory processing and this research revealed that there is a close connection between hyposensitivity or hypersensitivity to auditory stimuli, which are responsible (for children with ASD) adopting stereotyped behaviours. The assessment revealed that children with ASD, have a very fine hearing and they do not have problems with pronunciation of sounds at the level of words. Therefore it is clear that hyposensitivity or hypersensitivity to auditory stimuli is not caused by hearing problems, but that there are some irregularities in the processing of stimuli in the brain, in children with ASD. This means that these children hear but cannot gather certain information from the environment in a global way. The child has difficulties in adapting to the environment he lives; his nervous system is in a state of imbalance. The brain fails to manage environmental information and does not know where to integrate them so the child could no longer cope with. Because of this the child may have a different reaction to auditory stimuli and behaviours they are engaged include: impulsiveness, stereotypes, inappropriate behaviours. These behaviours are used by the child to try to reduce hypersensitivity or hyposensitivity, as a way of trying to cope with the environmental world, which he does not understand it. Keywords: autism spectrum disorder, auditory processing, auditory processing disorder, hyposensitivity, hypersensitivity. There are studies that underscore the presence of swallowing disorders the in pediatric area, especially among children with disabilities. One of the most common causes of this occurrence are neurological disorders such as children with moderate and severe cerebral palsy. Swallowing disorders can have a significant impact on their development and general health. Reduced nutritional intake accompanied by deceleration weight, prolonged feeding, and especially respiratory complications, which are the major cause of premature mortality, are just some of the arguments that stress the importance of early intervention. The American Speech-Language-Hearing-Association (ASHA) reveals the important role of a speech therapist in the interdisciplinary team in initiating a specific intervention, in the context of the particular swallowing disorder. Based on these assumptions the purpose of this paper is to illustrate the particularities of a speech therapist’s intervention in the context of swallowing disorders in children with cerebral palsy. This shall begin with the steps of an assessment and a specific intervention focus on the use of sensorimotor therapy, including the counseling of the child's family into the implementation of correct posture during swallowing, and the main maneuvers to facilitate swallowing. Keywords: SPCS - Social Pragmatic Communication Disorder, Story Map Technique, Eye Control Technology, Erasmus+ Framework.